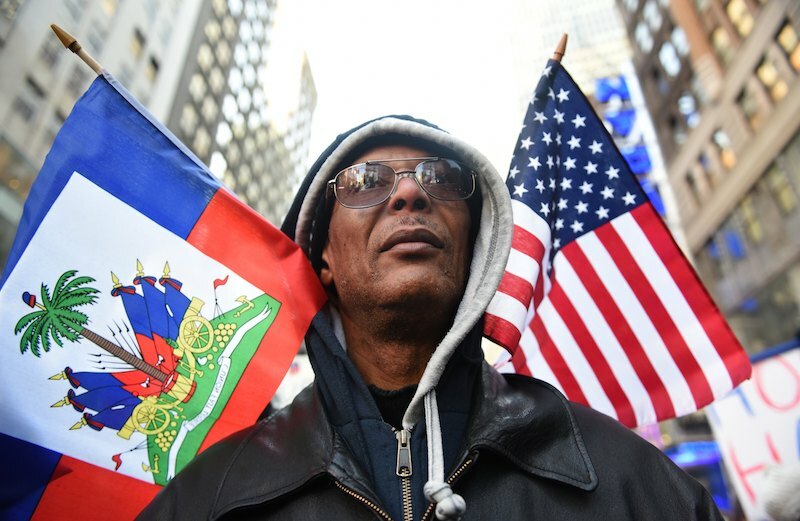 Protestor Pierre Gabriel, from Haiti, during a march in New York in January 2018. On the morning of June 2, 2017, Odette Dureland woke to a loud knock on the door of the one-story bungalow that she shares with her husband and her children. She was recovering from minor surgery, so her 26-year-old daughter, Rebecca, rose to open the door. Outside, there was a group of federal agents from Immigration and Customs Enforcement. Rebecca was confused: Everyone in her family was a citizen. She told the officers there must be a mistake. They told Rebecca there wasn’t; they had a warrant for the arrest of her mother. One officer ordered Odette to dress and then led her out of the house and into a government vehicle. At that time, Odette, Gilbert and Rebecca had been American citizens for five years. They had lived in the United States for more than two decades, since political violence in their native Haiti forced them to flee in the mid-1990s. Gilbert had joined protests following the first overthrow of the Haitian president Jean-Bertrand Aristide, which made him a target of the new ruling party — he was beaten and jailed, his right eyeball destroyed. Odette remembers her husband coming home, his face battered. Gilbert fled to the United States. Odette and Rebecca eventually followed, boarding a rickety boat and landing on a Florida beach. In 2012, Odette, Gilbert and Rebecca finally applied to become United States citizens, and later that year they took their oaths of allegiance. “It felt big, like we were really American, even though I’ve been here for all my life,” Rebecca says. Odette, too, felt a sense of deep relief after becoming a citizen. “We came from a country where there was chaos,” she says. “When we had the opportunity to become citizens, we thought this was the best thing to do, that it would provide safety.” She had not anticipated how freeing it would feel to engage fully as a citizen, in the country that had become her home. She voted in her first United States election and traveled back to Haiti for the first time in nearly two decades, without worrying that her life in America was at risk. But then, the knock on the door. The officers were agents from Homeland Security Investigations, a sprawling investigative unit within Immigration and Customs Enforcement. A week earlier, they told Odette, she had been indicted in federal court in Tampa. The Justice Department claimed that in 1997, before her husband filed his asylum claim, Odette applied under a different identity; her fingerprints and photograph were part of the application for Enite Alindor, a last name close to her mother’s maiden name. After that application was filed, no one ever again appeared to pursue it. An immigration judge ordered “Alindor” deported in absentia. Dureland was charged criminally by the United States attorney for the Middle District of Florida. Dureland’s attorney, a federal public defender named Irina Hughes, eventually presented evidence to the judge that a document preparer Dureland had hired to help before she was granted asylum was convicted criminally several years later for defrauding clients, using their names and identities to file fake tax returns. Hughes suggested that the “Alindor” asylum application might have been connected to one of the man’s schemes, but the judge would not allow this evidence to be heard by the jury. Hughes also pointed to testimony by government officials who told Congress in the 1990s that immigration records from the time were often handled by private entities, including untrained storefront processors — so it would have been unsurprising to find a fraudulent application with someone else’s prints. There was no way, Hughes argued, that the government could credibly come back decades later and use those haphazard records to prove anything. Dureland’s case was filed as part of an Immigration and Customs Enforcement program called Operation Second Look, which grew out of a U.S.C.I.S. program started under the Obama administration called Operation Janus. Both operations seek to identify cases in which people might have been naturalized despite apparent deportation orders or concerns about past fraud or criminal charges. The investigation into Dureland was coordinated with a unit in the Justice Department’s civil division called the Office of Immigration Litigation. That office, which devotes most of its resources to defending the federal government on immigration matters in court, is the nerve center for denaturalization actions in the department. From 2004 to 2016, denaturalization cases filed by that office and by United States attorneys have averaged 46 each year. In each of the last two years, prosecutors filed nearly twice that many cases. Last January, the Justice Department announced what it said was the first conviction for denaturalization fraud to come out of Operation Janus, which along with Second Look is looking into 315,000 immigration cases in which concerns had been raised but fingerprints were not uploaded to the government’s digital system. Some of those people, the government worried, may have gone on to become citizens using fake identities. By the end of the Obama administration, the Department of Homeland Security planned to refer 120 cases to the Justice Department to face potential federal charges. Now, in announcing the first denaturalization, the Trump administration said in a news release that the United States Citizenship and Immigration Services planned an expansion: The agency sought to refer 1,600 people to the Justice Department to face charges. A month later, U.S.C.I.S., which processes green-card and citizenship applications, changed its statement of purpose, removing a commitment to fulfill “America’s promise as a nation of immigrants” and promising instead to focus on “securing the homeland.” Attorney General Jeff Sessions then issued a strategic plan for the Justice Department as a whole, listing denaturalizations among a short tally of “strategic objectives” for the next five years. This summer, it became clear that the Trump administration was ramping up denaturalization efforts. U.S.C.I.S. said it was forming a new office in California, to become fully functional sometime next year, that would replace and consolidate existing Operation Janus work. The agency is actively hiring lawyers to staff the unit. The number of cases that U.S.C.I.S. has flagged as likely targets for denaturalization has risen to 2,500. The agency has referred 167 cases to the Justice Department for civil charges, nine of which have already led to denaturalizations. (ICE would not say how many criminal cases it had referred to United States attorney’s offices.) The Department of Homeland Security also asked Congress earlier this year to approve funding to hire 300 new agents for other immigration-fraud investigations, including Operation Second Look. And now ICE says it is sharply expanding the number of files under review. Its deportation division, Enforcement and Removal Operations, is looking into 700,000 additional files to find evidence of fraudulent naturalization, despite U.S.C.I.S.’s saying it considers them very low priority. That brings the total number of files under scrutiny to more than one million. U.S. Attorney General Jeff Sessions speaks at the Georgetown University Law Center September 26, 2017 in Washington, DC. Since January 2017, United States attorney’s offices have filed 107 criminal naturalization fraud cases. Among these cases are a number against people like Odette Dureland, naturalized citizens who purportedly committed fraud but who deny those claims. Many involve people whose histories raise no national-security concerns — an apparent departure from the Obama administration’s priorities. But the number is on par with prosecutions during the Obama era. Where there has been a marked rise in denaturalizations under Trump is in the civil process. Lawyers in the Office of Immigration Litigation filed more than 65 civil denaturalization cases between January 2017 and November 2018, according to data from the Justice Department, twice the total number of civil cases that the office filed in the last two years of the Obama administration. Some of these people would most likely have been denaturalized under any administration, including people who were convicted of serious crimes or were discovered to have participated in war crimes. But the Trump administration’s prosecutions have served another purpose: In news releases and declarations by senior officials, the denaturalization cases have been used as cudgels — tools for attacking the legal immigration process as riddled with fraud, as pathways for criminals and terrorists to enter the United States. Revoking citizenship has been part of the American citizenship system since the earliest efforts to centralize it. Beginning in 1906, officials in the federal government began to denaturalize immigrants who had obtained citizenship through fraud, often then allowing them to reapply. But as Patrick Weil, a historian and legal scholar at Yale, details in his 2013 book, “The Sovereign Citizen: Denaturalization and the Origins of the American Republic,” what began as an administrative cleanup soon became overtly political. Within a few years, denaturalization was being deployed against political subversives, most famously Emma Goldman, the anarchist and Lithuanian immigrant who for years had confounded efforts by federal officials to deport her. Prosecutors discovered that her husband, through whom she had obtained citizenship, was himself naturalized through fraud. In 1909, the government stripped Goldman of her citizenship, and she was eventually expelled. For the next 50 years, the federal government revoked the citizenship of thousands of naturalized and United States-born citizens. Many were targeted for their associations with communists. Others lost their citizenship because they had moved abroad after naturalization or had voted in foreign elections or served in foreign armies. Women were summarily stripped of citizenship for marrying foreign men. Weil found that between 1906, when naturalization law was standardized and centralized, and the 1970s, 145,000 United States citizens, native born and naturalized, were stripped of their citizenship by the courts. Many others lost their citizenship without any judicial process at all. But a series of court decisions in the 1950s and 1960s curtailed that process. In the most significant of these, in 1967, the Supreme Court in Afroyim v. Rusk ruled in favor of a Polish Jewish immigrant named Beys Afroyim who had become a United States citizen. Afroyim had voted in an Israeli election, which at the time was an offense that could lead to denaturalization. The court ruled against the government: “Citizenship is no light trifle to be jeopardized any moment Congress decides to do so,” Justice Hugo Black wrote. Citizenship, acquired either by birth or by naturalization, was now held as a nearly unassailable right, no longer hinging upon adherence to norms imposed by the state. In the 50 years since then, courts have further tightened the requirements for denaturalization. Mass stripping of citizenship is no longer possible. The government can now denaturalize citizens only if the state can prove they should never have obtained citizenship in the first place, i.e., if it was acquired through some material fraud or misrepresentation. And yet politics has continued to drive rounds of denaturalization prosecutions. After the Republican Party won control of the House in 1994, the new congressional majority began to denounce the Clinton administration, claiming that the Democrats had opened the gates to citizenship for criminals as a way to expand the ranks of Democratic voters. The Justice Department responded by devising a streamlined denaturalization process that would allow Immigration and Naturalization Services, or I.N.S., to administratively strip citizenship from recently naturalized people who had been convicted of crimes — sidestepping the courts. The agency compiled a list of 369 cases of people with serious past convictions, planning to strip them of their citizenship. Those plans were upended by a lawsuit decided in 2000, when the court ruled that federal officials were required to take denaturalization cases to court. As a smaller number of those cases rolled through the federal courts, the early years of the George W. Bush administration were marked by a spike in civil denaturalization actions, which reached a peak of 50 in 2001. During the Bush and Obama administrations, a number of citizens were stripped of their citizenship after being implicated in a sprawling immigration-fraud scheme — they paid bribes to a D.H.S. official to process their immigration applications. A handful of others were denaturalized for being war criminals. The seeds of the current denaturalization campaign were sown as early as 2008, when a Customs and Border Protection officer discovered 206 cases of people from “special-interest countries” like Afghanistan and Iraq, and countries that border them, who appeared to have once been ordered deported, but had gone on to obtain green cards or become citizens. The Department of Homeland Security began looking into those cases, only to discover thousands of other old immigration files that had never been uploaded to digital immigration databases. In September 2016, near the end of the Obama administration, the inspector general for the Department of Homeland Security reported a total of 315,000 previously undigitized sets of fingerprints associated with immigrants whose files raised possible concerns. Just over half of those prints had been uploaded since the problem was discovered in 2008. More than 850 people from special-interest countries, or countries that bordered them, who were apparently ordered out of the country and whose fingerprints were not in the digital system had still gone on to become citizens. Just a few appear to have raised serious concerns, and they were referred to the Justice Department or to Joint Terrorism task forces for further review. Another 953 cases had also been flagged for possible review. The inspector general recommended the government to finish uploading the remaining files, a process that the report said had stalled for lack of funding. It also recommended that ICE determine how to proceed with the remaining files. Former Obama officials told me that they believed that few of the flagged cases would rise to the level of major priorities for federal agencies. “We wanted to know who had become a citizen and to see if there was anyone who raised real concerns” about security, says Ur Jaddou, the former U.S.C.I.S. official. For example, she noted that the inspector general had flagged a handful of cases that involved people who had obtained security clearances or government jobs after naturalizing. By March 2015, with the case-file reviews well underway, Obama’s D.H.S. had referred several dozen cases to the offices of the United States attorneys, which in turn decided to prosecute only two. By the time the inspector general’s office released its report in September 2016, the Department of Homeland Security had referred a total of 120 cases to the Justice Department to consider for prosecution. Several former Obama officials told me that the spike in court cases by the Trump administration may be explained by Operation Janus, adding that the numbers for 2017 and 2018 might look similar under a Democratic administration. U.S.C.I.S. also characterizes the growing number of cases under review as the natural expansion of the Janus process. 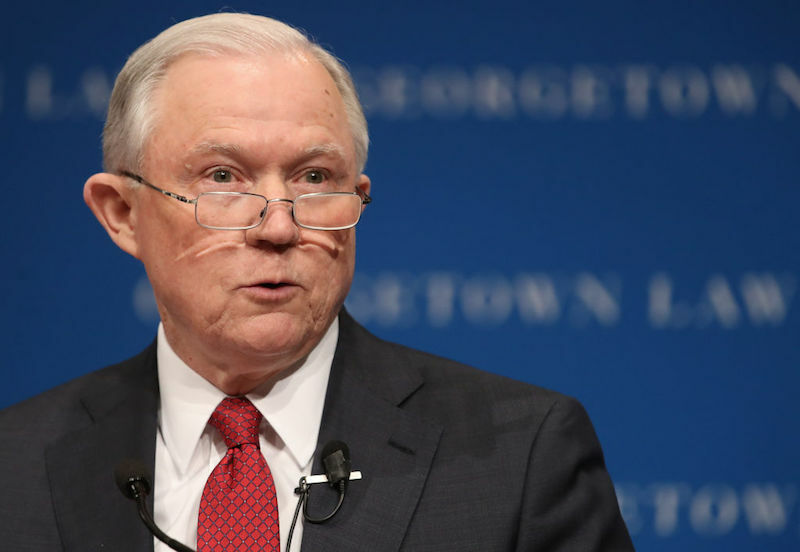 It is an open question how much the number of people charged will grow under the Trump Administration, as the Justice Department prioritizes denaturalization efforts and the scope of the files under review expand. In October of this year, the State Department’s inspector general released a report that found these Obama-era passport seizures had not followed any discernible process and were not backed by clear rationale. Nonetheless, those passport seizures appear now to have created yet another pool of people — like those from Janus and Second Look — who can be targeted with denaturalization. For years, Alsadah was worried about exactly this possibility, and under the Trump administration it has begun. Alsadah has met several families in Detroit whose passports were revoked under the Obama administration and who have now been threatened with denaturalization, including Abdo Wasel, whom I met this summer through his lawyer. In June 2017, Wasel, who is 53 and lives with his family on a quiet street in Hamtramck, Mich., received a letter from the Justice Department that read, “The government has evidence that you illegally procured your naturalization.” Based on this evidence, which the letter did not specify, he had not been eligible to become a United States citizen. Wasel was confused. He left Yemen in 1990, when he was 25, following his father. Wasel settled in Hamtramck, a town near Detroit with a growing Yemeni community, and found work in warehouses and factories. For several years, he traveled back to Yemen whenever he could; he married there, and some of his children were born there. But after he became a United States citizen in 1995, he started bringing his children to Hamtramck, one after another. He and his wife now live in a five-bedroom home, on a street lined with vinyl-sided two-story homes. Wasel’s oldest son lives with his own wife and their children in a house on Wasel’s block. Wasel says his troubles began in 2015, after he applied to renew his United States passport to travel to Yemen. The country was becoming increasingly unstable, and he wanted to visit relatives and possibly help them come to the United States. Months passed, and he hadn’t received it. He returned to the passport office several times, where he was told the government was looking into his case. During one stop at the office, Wasel says, State Department officers told him they needed him provide a saliva sample so that they could perform a DNA test to verify his identity. He did not know at the time that the refusal to renew his passport — and later the United States passports of two of his children — was part of a broader practice by the Obama administration. For him, the loss meant he could not make any plans to visit the place he was born. Wasel was also unaware that in February 2016, State Department agents showed up at the California home of his father and asked the older man to submit to a DNA test. The results showed that the men were not biologically related. His father finally told Wasel the truth: He was orphaned as a baby, and he and his wife raised him as their own. Wasel was stunned. He says the story was entirely new to him, and he could only speculate about how the government came to suspect a back story that he had never even imagined. No official has ever explained to him how the investigation came about. Of the civil denaturalization cases that have so far been filed by the Office of Immigration Litigation under the Trump Administration, roughly 10 percent have been against people from three countries — Yemen, Somalia and Iran — that are included in Trump’s ban of Muslim nations. But people from these countries make up just over 1 percent of foreign-born people in the United States. “They are cherry-picking, picking and choosing, focusing on these communities,” Alsadah said. If Wasel’s citizenship is stripped, the government can cancel the citizenship of his children born in Yemen. Because Wasel’s case is a civil action, there’s no threat of prison time. But there’s also no access to a public defender and no statute of limitations — prosecutors can file charges against people like Wasel whose citizenship was obtained decades ago. And the standards for denaturalization are more lax; prosecutors have no burden to prove intent. In a pretrial brief filed in July, prosecutors clarified that the government acknowledges Wasel may well not have known that his father is not biological kin. They say that doesn’t matter. “It is entirely irrelevant when Defendant learned that” the man “is not his father and whether he subjectively intended to provide incorrect information,” the government wrote. In another recent case, this one drawn from Janus files, the United States attorney for the Middle District of Florida — the same office that brought the charges against Dureland — failed to persuade a jury to convict a Bangladeshi-born United States citizen for criminal citizenship fraud. The claims against the man, Shorab Hossain, hinged significantly on a single letter of his first name. In an asylum application filed in 1995, soon after he arrived in the United States, Hossain signed his name as Sohrab. The government denied that petition and he was ordered deported, but Hossain claimed in court that he never received the order. Believing his application had gone nowhere, he later applied again to remain in the United States and signed this time as Shorab, switching the O and H — two plausible spellings of a name that Hossain, until his arrival in the United States, had written only in Bengali. The jury, apparently unconvinced that he had intentionally sought to alter his identity, acquitted him in April (the jury hung on a separate related charge), and he returned home to his wife and stepdaughter, and to work at the gas station and convenience store he owns. But one month later, the prosecutor told the judge that the Department of Homeland Security was considering a civil case against Hossain — this time, with no burden to prove intent.